There are three primary advertising placements available on DealerRater, each with it's own size and specifications. Every Certified dealer gains access to the advertising space on their Dealer Profile Page, and all advertising placements owned on DealerRater include access to the mobile format advertising space at no additional cost. Additional advertising placements, such as advertising on Service Profile or Directory pages, may be available as part of an upgrade. Please see the chart below, with details following, for more information about advertising placements, specifications, and files available on DealerRater. Dealer Profile Pages: Every Dealer Profile Page on DealerRater contains an advertising space located on the left-hand side of the page, above the 'Recently Reviewed Employees' and to the left of the most-recent review on the page. Addiitonally, dealerships which paritcipate in the ServcieEngage program may post advertising to their Service Profile Page. The dimensions of the advertising space on Profile Pages is: 300 x 250 pixels. Unowned advertising spaces may display targeted ads from online ad services. Dealership Directory Pages: DealerRater directories are divided up by brand of vehicle, and by State, City, or zip/postal code - for example Volkswagen dealers in Masachusetts. Every directory page has an advertising space at the top of the page, with dimensions of 728 x 90 pixels. Advertising owned on these pages is often referred to as State Banner ads (for State Directories) or DMA Banner ads (for zip-code targeted DMA directories.) As with Dealer Profile Pages, unowned advertising spaces may display targeted ads from online ad services. Mobile format pages: Any DealerRater which contains an advertising placement may also be viewed on a mobile device, and will display in a mobile-friendly format. When viewed in a mobile format, all DealerRater advertising spaces have dimensions of 600 x 180 pixels, regardless of the full-site dimensions of the advertising space. The following file formats are supported on some or all of the available advertising spaces - please read the descriptions below for more information. If you are intersted in gaining access to update your dealership's advertising on DealerRater, please click here for more information. JPG: JPG files are static image files, and may be used in any advertising space on DealerRater. In addition to the JPG file itself, you will also need the URL you would like the advertisement to link to when clicked. GIF: GIF files are animated images, and like JPG's may be used in any advertising placement. Also like JPG's, you will need the target URL you would like the ad to link to when clicked. 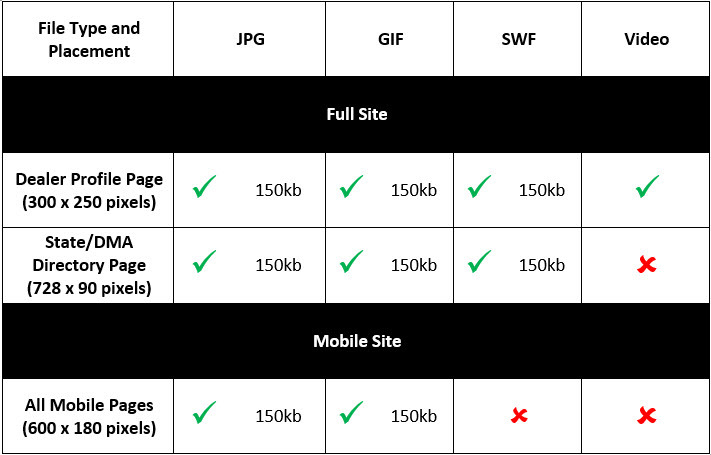 SWF: SWF (Flash) files contain flash animation or video, and may be used for Dealer Profile Pages or Directory Pages only, they will not work for mobile advertising. Any target URL clickthrough must be built into the SWF file before it is posted. Video: Videos may be used for DealerRater advertising, provided the video is available on YouTube. Once the video has been posted to YouTube, it may be embedded into a DealerRater advertising space. Because of the dimensions of the various advertising spaces, Video ads are only usable on Dealer Profile pages - the other advertising placements will not allow for a video in a watchable shape and size. Ads must not contain false or misleading statements or suggestions. All ads must display your dealership’s logo. All ads must open a new browser window or tab. All non-Flash ad updates can be self-managed in the Dealer Panel. Ads cannot expand in size without prior authorization. Audio must be initiated by user. Video must be initiated by user. DealerRater can link to video files or host .swf files only. Flash ads are not supported by Mobile Platforms. Must already include an embedded click-thru link. Must serve an image (JPG/GIF) if the user doesn’t have Flash installed. Must be in .swf format.